The magical world of wireless speakers for the iPad – Two New Options! We have had a variety of Bluetooth speakers through the office. They are particularly nice for company get togethers and when doing a presentation in a conference room. After the initial ‘pairing’, the bluetooth speaker shows up quickly so there isn’t a delay in getting a meeting started. Today, we discovered two new wireless speakers. Neither are Bluetooth, both are using the latest wireless technology. The first is the ifrogz Boost ‘Near Field’ solution. Sure, the iPad/iPhone do not have true ‘Near Field’ built in. For the ifrogz Boost, it is just what they are calling the technology. The speakers work by simply placing the iPad on top of the device. No wires to connect. The Boost runs on 3 AAA batteries, which are good for 15 hours of audio playing. 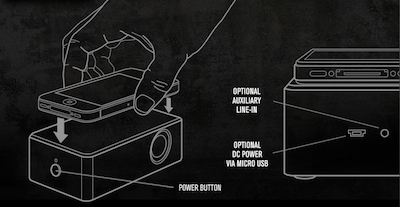 There is also a mini-USB plug on it that can be used for power instead of using up the batteries. The Bluetooth speakers we have been using allow for moving around the room and controlling the music from the device in hand while the Boost only works if the iPad is sitting on top of it. But, any device sat on it with it’s audio playing. The ifrogz Boost is about $40 with free shipping over on their site right now. The next is the Altec Lansing inAir™ 5000. This solution receives it’s audio feed from the iPad via AirPlay. Similar to the earlier Bluetooth solutions we have used from Altec Lansing, the AirPlay capability allows the iPad to be moved around the room. This solution is on the high end of robust sound, which in this case means the hardware is much larger too. 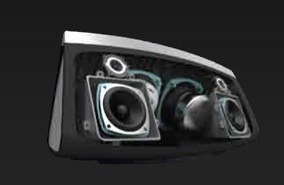 The Altec Lansing inAir™ 5000 will command attention in any room with it’s high end look. 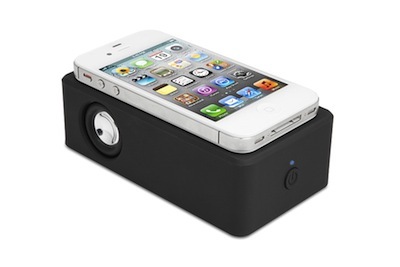 We won’t get into the pricing of the inAir 5000… Altec Lansing technology is really nice but doesn’t come cheap.